As Lola Kirke discussed in a letter for us last year, there are many who choose to eschew the celebration of Thanksgiving due to the bloodshed interrelated with its beginnings and instead use the day as a celebration of family, friends and the abundance of the harvest. These have long been necessities for a good Thanksgiving as depicted below, in a passage from Dorothy Draper’s seminal 1941 book, Entertaining is Fun! How to be a Popular Hostess. The influential decorator describes the importance of loving guests, good stories and a delicious menu (one that has changed little in 76 years). “Does the turkey make Thanksgiving? Or is it Thanksgiving that gives reason for the family dinner? If you believe the latter you will feel, as I do, that the oldest American holiday ought to mean a great deal more than two helpings of roast turkey, pumpkin pie an uncomfortable feeling all the rest of the day and the next. "Thanksgiving is, above all else, a family day. A day when the four generations come together. It is the day on which to retell the old family stories – how Great-Grandmother L – made the trip down the Ohio River on a flatboat when her parents started West with the pioneers. How Great-Uncle James ran away from home to go to sea and later sailed round the Horn to California. How Cousin William took up farm land and built a sod house to live in where there’s a thriving industrial city today. Every American family has stories like these to remember. Part of the entertainment plans for Thanksgiving Day can be given to making time and a place for storytelling. During the family dinner or in the evening around the open fire, with a big jug of country cider and a bowl of fruits, nuts and raisins." "A young uncle of mine and his wife who live in the country once invited all the family to spend Thanksgiving Day with them. Some came by train and some by automobile. It’s a big family. When we arrived at this white Long Island farmhouse we found the front door flanked by two tall stacks of corn with golden pumpkins at the foot of each one. My uncle opened the door. He was dressed up like a farmer in overalls and a blue shirt and a wide straw hat. His wife was dressed like an old-fashioned farmer’s wife in a prim pink calico dress and a starched apron and a sunbonnet." "The dinner table was stretched to its furthest capacity, and there was another table for the small children. Both tables were covered with cloths of big green-and-white-checked gingham (three-inch squares). My aunt had bought the gingham by the yard and hemmed the cloths and napkins to match. Down each table was a lovely arrangement of red apples, ears of corn, vegetables and fruits. On each table, too, were big old-fashioned jugs of beer and cider." "There were place cards with red turkeys on them. And shiny new tin plates from the ten-cent store. The first course was oyster soup, served in yellow bowls (also from the crockery counter of the ten-cent store). Then came the turkey (three of them, in fact, stuffed with creamed puree of chestnuts. I’ve said it was a large family). There were candied sweet potatoes and celery and a green vegetable. There was corn bread, sweet and piping hot. There was a mixed green salad served in little individual wooden salad bowls. And for dessert pumpkin pie, and “country coffee” in big cups." "Everyone sat a long time around the table telling the old family jokes and stories. Then my aunt gave the signal and we all went into the living room where there was a piano. There was music laid out on it, all old-fashioned songs that everyone knew and could sing. Later on we had a magic-lantern show. The slides were photographs of members of the family when they were babies, and we had to guess who was who." Image 1 from Better Homes and Gardens Guide to Entertaining, 1969. Image 2 by Richard W. Brown from Vermont Life, Autumn 1974. 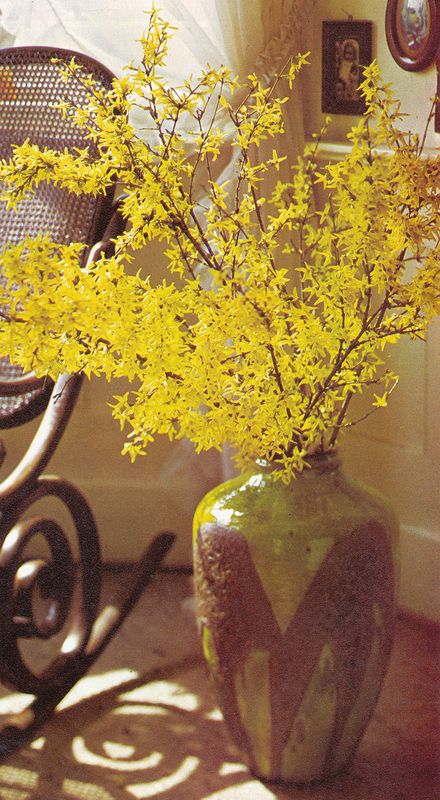 Images 3, 4 & 5 from The David Hicks Book of Flower Arranging, 1976. Image 6 by R.J. Alzner from Vermont Life, Autumn 1974.